Our passion for cafe window shutters is second to none, being versatile and pretty much suiting any room, we find ourselves quoting prices and installing half height shutters for customers all the more often these days. One of the advantages is that they allow more light into a room without detracting from any privacy you might wish to gain. That’s why we often find these on ground floor windows as they do precisely that, maintain privacy whilst keeping a room very light and airy. You can see an example of cafe style shutters on a bay window here which shows how properties opposite can’t see into the room, which goes for people from the street as well. 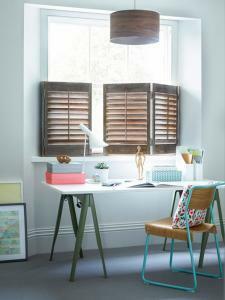 What styles are cafe shutters available in? Our cafe style interior shutters are available in all of the colours that our regular height window coverings come in too, so you’ll never be short of choice. We can paint them any colour available petty much! That said, we feel like our favourite colours and wooden stains are consistent in cafe shutter styles as they are elsewhere in our product range, with white and deep wood stains being most popular over the years. Similarly all four slat sizes are all available, and you can dress them up or down with front mounted or hidden pushrods. Basically the choices are pretty endless, but our designers will help you as much as you need them, choosing what suits your home perfectly if you would like our help! 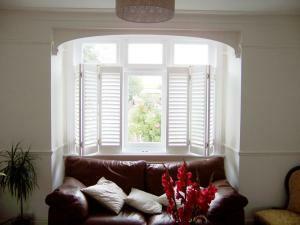 The good news is that half height shutters have a distinct advantage if you are on a budget as they are generally more cost effective than full height products. The frame is slightly more complicated to manufacture but there’s less material involved so a definite saving for our customers. 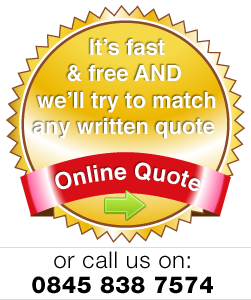 If you’ve measured your windows for shutters why not find out the cost of shutters with a free written quotation just for your windows, wherever you are in the UK!